We can solve any problem/conflict with bats, from a single bat inside your house, to a huge colony of thousands of bats in your attic. Bat control requires extensive training and specialized techniques. Do not trust just any company to come and remove a colony of bats from your building. Many factors determine the methodology utilized in bat control tactics. From type of architecture, size of colony, specie of bats or time of year, it takes a great deal of experience to do the job properly. It's very important that all of the bats are removed, and that none are harmed or killed in the process. Read about Is it legal to trap a bat in Illinois? We pride ourselves on the very best bat control work. We ensure that your home or building is left 100% bat-proof and that no bats will be able to return into your building. We take care to remove all of the bat waste (guano) left behind, in order to eliminate the biohazard factor and health risks. If you need bat control, please take care to get it done right - give us a call any time to discuss your bat situation. The most common type of bat that we deal with in the Chicago area is the Little Brown Bat (or Little Brown Myotis). We also deal with the Big Brown Bat. These bats often form what are called maternity colonies inside of buildings. These are groups of primarily female bats that congregate and have their young once a year, in the summer. Oftentimes a colony will start off small - perhaps 20 or fewer members. But if left untreated, with time the colonies can grow to huge sizes, in the several thousand member range. 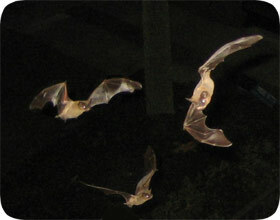 Colonies of bats are often quiet, but grow in noise level as the size of the group increases. The primary problem with bat colonies is that they can leave tremendous amounts of waste in your building or attic, and this waste can pose a health risk. Additionally, colonies of bats often result in stray bats within the home, and the risk of rabies infection. How to get rid of Chicago bats - Bats can�t be treated like other pest animals. They most certainly are not �flying rodents�. They do not belong to the rodent family. The issue with bats is that they are routine visitors to favorite roosts; once a bat colony has lived inside your home, they will return to that area annually. There are a number of laws protecting bats, prohibiting the killing of or relocation of a colony when found. This can make trapping bats very difficult because you won�t know what to do with them once you have them. The best method for getting rid of bats is to exclude them from the roost site. This is done by installing special netting or one way doors. The goal is to have the bats exit the building as they normally would to go hunting and have the netting or door prevent the animals from returning. While this is a very effective way to manage bats, a professional should be called in to make sure no infant bats are going to be left behind. Leaving young bats inside the building will be like leaving adult bats inside. Once the babies die from a horrible death of starvation, they will create a horrendous odor that will not go away until all the bodies are removed. Do not kill bats in your Chicago bat control process. Hi, I manage several condo buildings in Chicago Illinois. For the past few years we have had a problem with bats getting up into the eaves and probably the flexicore tubes for the roof. We can see the bats exit the buildings at night. We used to have bat houses but the health department made us remove them from the areas on the buildings just below the eaves. (By the way, they were using the bat houses, and while an occasional bat got into a unit, usually thru a patio door, one of the residents called the health department and they told us to remove the bat houses, they were too close to where people lived. When we removed them the bats found the eaves and went inside. This year we have had a couple of units on the top floors, which have had a bat inside. One was getting through a hole in the kitchen ceiling above a drop ceiling, and we do not yet know how the other ones got in. We recently, 10 days ago, put several bat houses in the trees around the areas where we had the intruders, but I realize it will take a while for them to find them and hopefully start using them. How can we get them out of the eaves? They are aluminum, and sit in channels, and we obviously can't seal up the flexicore tubes that run across the entire tops of all of our buildings. Any suggestions you might send my way regarding Chicago bat removal would be greatly appreciated.